The Dodgers rebounded from a disappointing inaugural season in Los Angeles to capture the hearts and souls of all of their fans, winning their first World Series title in their new home. Physical changes were made to the Los Angeles Memorial Coliseum prior to the season, as the center field fence was brought in from 425 feet to 410 feet. The 440-foot right-center distance was shortened to a more manageable 375 feet. The Dodgers were locked in a great pennant chase with Milwaukee and San Francisco all the way to the finish. In a typically wild and wooly race, San Francisco was ahead of the Dodgers and Milwaukee by two games and Los Angeles had no home games remaining. The Dodgers beat the Giants in a day-night doubleheader, 4-1 and 5-3 to tie for first place, while the Braves beat Philadelphia to move one-half game behind on Sept. 19. 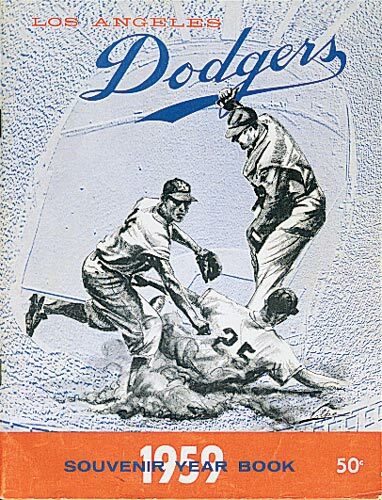 The next day, the Dodgers and Johnny Podres beat the Giants, 8-2, to take a one-half game lead over Milwaukee and a full-game edge over San Francisco. On Sept. 21, the Braves were the only team of the three to play and they beat Pittsburgh to draw into a tie for first. On Sept. 22, the Dodgers lost 11-10 in St. Louis, while the Giants fell to Chicago, 5-4 and the Braves moved into first with a 5-3 win at Pittsburgh. The Dodgers had nine pinch hits in their game. 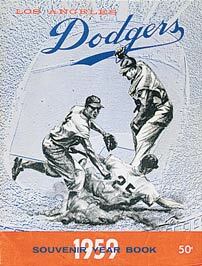 The next day, the Dodgers and Roger Craig shut out the Cardinals, 3-0, while the Braves and Giants lost. The Dodgers and Braves were again tied for the lead, with San Francisco falling two behind with their fifth straight loss. On Sept. 25, after all three teams had the previous day off, the Dodgers beat Chicago 5-4 in 11 innings on a Gil Hodges’ home run, while the Phillies beat Milwaukee, 4-3. The Giants were rained out. The Dodgers lost 12-2 to Chicago on Sept. 26, while the Braves beat the Phillies and the Giants won 4-0 over St. Louis in a rain-shortened, eight-inning no-hitter by Sam Jones. Finally, on Sept. 27, the Dodgers clinched at least a tie of first place by beating the Cubs, 7-1, while the Braves won at home against the Phillies to force a playoff series. The Giants dropped a doubleheader to St. Louis. 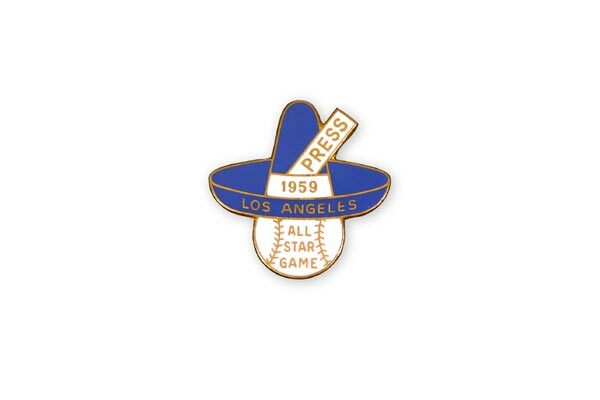 The tie set up the third playoff series in National League history and the Dodgers had been on the losing side of the previous two — the first against St. Louis in 1946 and the second to the New York Giants in 1951. The Dodgers defeated Milwaukee in the first game of the best-of-three game series to determine the N.L. Pennant, 3-2 at County Stadium. At home in the Coliseum, the Dodgers edged the Braves, 6-5 in a four-hour plus, 12-inning marathon to win the N.L. Pennant. Los Angeles, which finished the season with an 88-68 record, had the fewest victories to win a N.L. 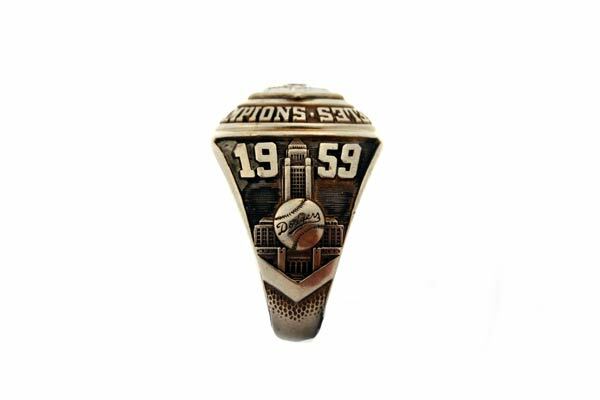 Pennant in history in a 154-game season (156 with the playoff games). 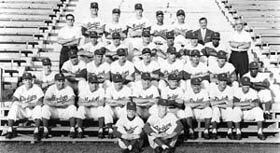 The Dodgers earned the right to play the American League Chicago White Sox, known as the “Go-Go Sox,” who had stolen 113 bases that year, in the World Series. The Sox had a 94-60 overall record and were managed by Al Lopez, a former Dodger catcher in the 1930s. The Dodgers lost Game 1 at Comiskey Park, 11-0, as Ted Kluszewski belted two home runs and tied a Series-record with five RBI. The Dodgers bounced back to win Game 2, 4-3, as Podres won his third straight Series game dating back to 1955. More importantly, each of his World Series wins followed a Dodger loss. The Dodgers won the next two games in Los Angeles. In Game 3, the Dodgers behind Don Drysdale’s pitching and Carl Furillo’s key two-run single won, 3-1. 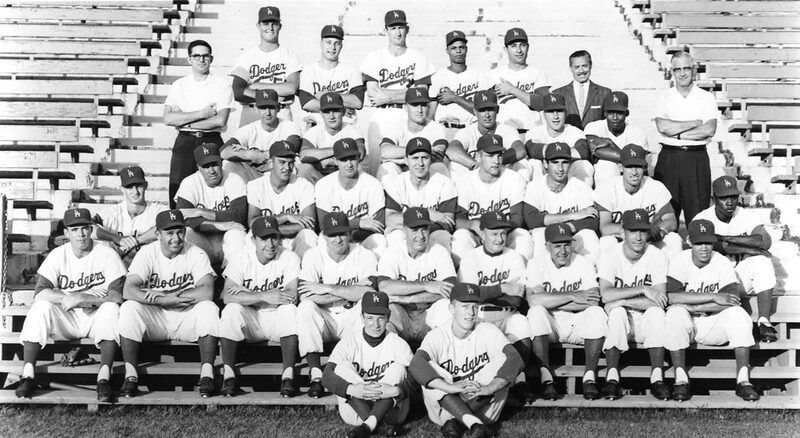 In Game 4, the Dodgers beat the Sox 5-4 on the wings of Hodges’ eighth-inning homer and the pitching of Larry Sherry. The Dodgers set an all-time World Series attendance record in Game 5, drawing 92,706 fans, their third consecutive game with 92,000-plus fans. But on the field, Chicago beat the Dodgers, 1-0, in a great pitching duel between Bob Shaw and Sandy Koufax. The only run, scored in the fourth inning by the White Sox came on a double play. 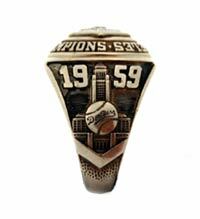 The final game was at Comiskey Park and the Dodgers prevailed, 9-3. World Series heroes included relief pitcher Sherry, a 24-year-old native Los Angeleno, who had joined the Dodgers at mid-season and figured prominently in all four of the Dodgers’ victories and Chuck Essegian, a former Stanford football player who had two pinch-hit home runs, including one in Game 6. Sherry was promoted from Triple-A St. Paul, an American Association League club, where he was 6-7 before going on to help the Dodgers with a 7-2 record in 23 games and 2.20 ERA. In the World Series, Sherry saved Games 2 and 3 and won Game 4 and the clinching Game 6. He had a 0.71 ERA in 12 and 2/3 innings pitched and won the Series MVP. Second baseman Charlie Neal delivered in the Series with 10 hits, the most by either club, two home runs in Game 2, six RBI and a .370 batting average. 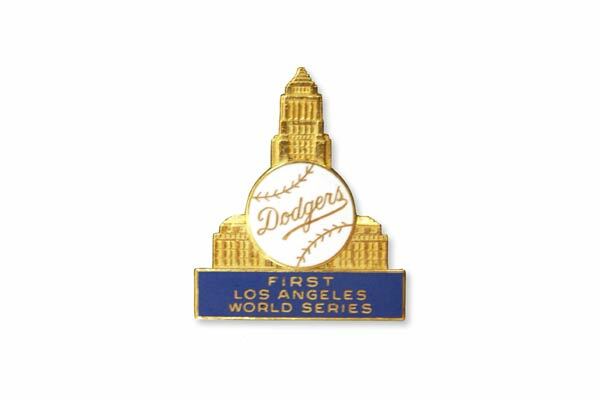 The final victory, 9-3, on October 8, brought Los Angeles its first World Series title and, for the Dodgers, their second Championship in five seasons. 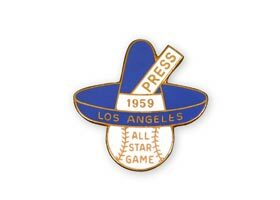 It had been a total team effort for the Dodgers, as they had no 20-game winners, yet many contributors in the tight pennant chase. Don Drysdale was 17-13 with a 3.45 ERA and led baseball with 242 strikeouts, while Podres was 14-9 overall and Craig was 11-5. Koufax was 8-6 but, on Aug. 31, became the first National League pitcher to strike out 18 batters in a game against San Francisco. Snider bounced back to hit .308 with 23 home runs and 88 RBI. Maury Wills, who had toiled as a lifetime minor leaguer since 1951 in Hornell, brought a spark to the club, helping to bring the flag to Los Angeles. Until September 7, Wills was batting only .207, but he caught fire and hit .429 in the last 17 games of the season to finish at .260 while playing 82 games at shortstop, a troubling position for the Dodgers since Reese retired. Executive Vice President and General Manager Buzzie Bavasi, who was named The Sporting News' Major League Executive of the Year, acquired Essegian from the St. Louis Cardinals and he contributed heavily when he hit two World Series pinch-hit home runs. Wally Moon would prove to be a key acquisition for the Dodgers, as he learned how to hit the ball the opposite way over the short left field fence and his “Moon Shots” became legendary. Moon, who had hit just .238 for the Cardinals, batted .302 and belted 19 home runs, mostly to left field. On May 7, the Dodgers paid tribute to three-time N.L. Most Valuable Player Roy Campanella at an exhibition game against the New York Yankees at the Los Angeles Memorial Coliseum. 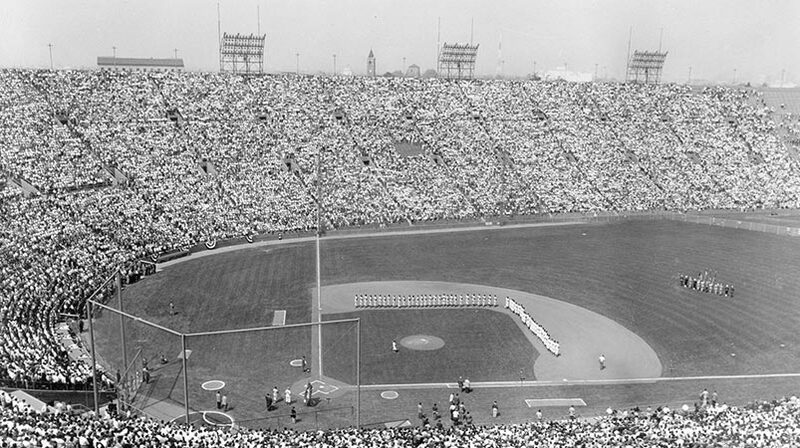 The largest crowd ever recorded for a major league game — 93,103 — came to salute Campanella, who had never played a game in Los Angeles due to his tragic auto accident on January 28, 1958, when his car slid off an icy New York road and went head-on into a telephone pole leaving him paralyzed from the neck down. One of the most courageous of all athletes, Campanella watched as the crowd lit a match and said a prayer for his well-being with the house lights turned off. He told the crowd, “I thank each and every one of you. 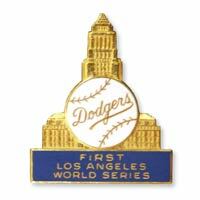 This is something I’ll never forget.” For the record, the Dodgers had played an afternoon game in San Francisco, defeating the Giants at Seals Stadium, 2-1, flown back to Los Angeles to play the exhibition game that night against the Yankees (they lost 6-2) and returned to face the Giants in San Francisco for the next day’s game. On Sept. 17, Walter O’Malley proudly participated in groundbreaking ceremonies for privately-built Dodger Stadium, amongst civic officials, Dodger executives and construction chiefs. Hundreds of guests and well-wishers watched as bulldozers raced down the hills to begin the grading and leveling process. Click image for a larger view1959 Dodger YearbookCopyright © Los Angeles Dodgers, Inc.
Click image for a larger view1959 DodgersCopyright © Los Angeles Dodgers, Inc.
Dwight (Red) Adams, Cliff Alexander, Hugh Alexander, Monty Basgall, Bill Brenzel, Matt Burns, Roy Campanella, John Carey, Pat Colgan, Leon Hamilton, Andy High, Henry Majeski, Kenneth Myers, Harold (Lefty) Phillips, Jake Pitler, Charles Russo, Jackie Warner, Bert Wells.